Rokit Boost has recently come up online with its new user-friendly e-commerce platform backed by high-tech design and shopper-friendly features. Leading tech retailer Rokit Boost has recently launched its brand new website to ensure a cutting edge shopping experience for users. The latest e-commerce platform is intelligently designed with state of the art tech infrastructure and shopper-friendly design for the ultimate convenience of online shoppers. The new site also debuts with 2 new products which are immediately available for purchase. Rokit Boost’s website stands out with its modern sleek and lightweight design. Visitors will be welcomed by a white soothing homepage which features the latest products available on the site. The top of the page is dotted by the search, cart and account icons to help shoppers to find and shop their desired products faster & more conveniently. The menu section opens up in a separate side page to avoid clutter on main home page. Users will be able to locate the menu page icon on top of the homepage. As one clicks on it, the icon will unfold and reveal the list of menus. “We are delighted to bring to you our brand new website www.rokitboost.com . User convenience is a big watchword for us and the very ethos is beautifully echoed at every step of our new advanced website”, stated the leading spokesperson from Rokit Boost. Rokit Boost’s new e-commerce website allows shoppers to choose from a number of contemporary payment options. Users can pay with Amazon Pay, Apple Pay, PayPal and any credit card. Shoppers would be able to shop and track their orders on Facebook Messenger. Rokit Boost’s Messenger link rests on the homepage only. The new website is currently offering two new products that can be purchased right now. These are Swage Air Bluetooth Headphones and Swage Sport II Bluetooth Headphones . 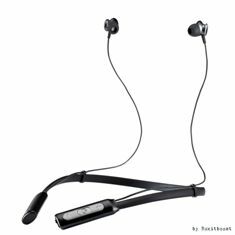 Both the headphones promise superior audio performance with their deep bass and high definition audio quality as well as lighter-than-air treble. The Swage Air Bluetooth Headphone is uniquely designed with oval shaped magnetic earbuds that assure extra comfort for the users. The advanced cordless headphone comes with a flexible neck that moves with the user and eliminates hassles of bouncing wires. Both the Swage headphones connect to any Bluetooth-compatible audio device in a jiffy with powerful Bluetooth 4.1 and can operate for 10 hours straight on single charge. Since 2009, Rokit Boost has had been a name of big repute in the world of premium yet affordable mobile accessories. The company has had launched some awesome top selling headphones on Ebay, Amazon and more such leading online retail sites. Rokit Boost is backed by a dynamic team which is always updating the product inventory as per the latest innovations in the tech market.